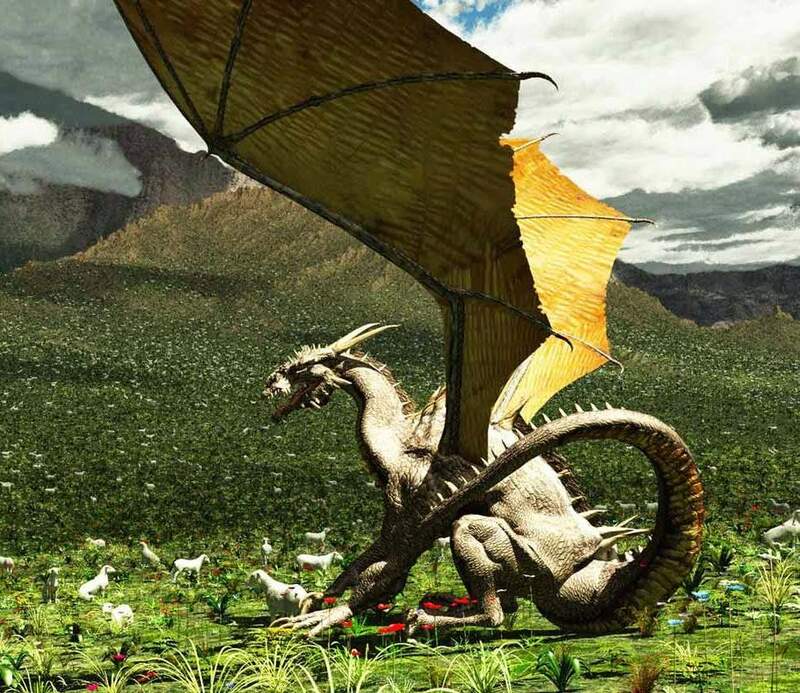 Did fire-breathing dragons really exist? Our answer is: Absolutely. We also won't bother getting into all the so-called "real dragon bones" that exist in various cathedrals and churches across Europe. Mainly, because they won't allow the bones out of the church to be examined, so we'll really never know, now will we? Besides, it's much more likely that the bones belong to a known dinosaur, rather than a true mythological-style dragon, whose bones magically only exist in churches. We'll also bypass the bit about how dragons were just exaggerated stories of crocodiles, or elephants, and what not. After all, we are trying to prove. Not disprove. 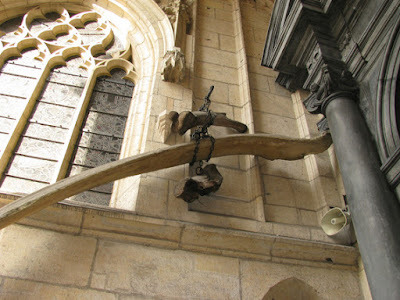 Real-life bones of Dragon, "Smok Waweleski," found at the Wawel Cathedral in Poland. Source. 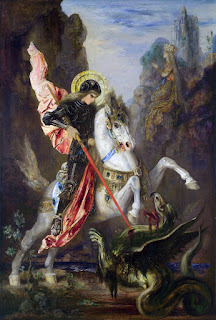 St. George & the Dragon, by Gustav Moreau. Source. 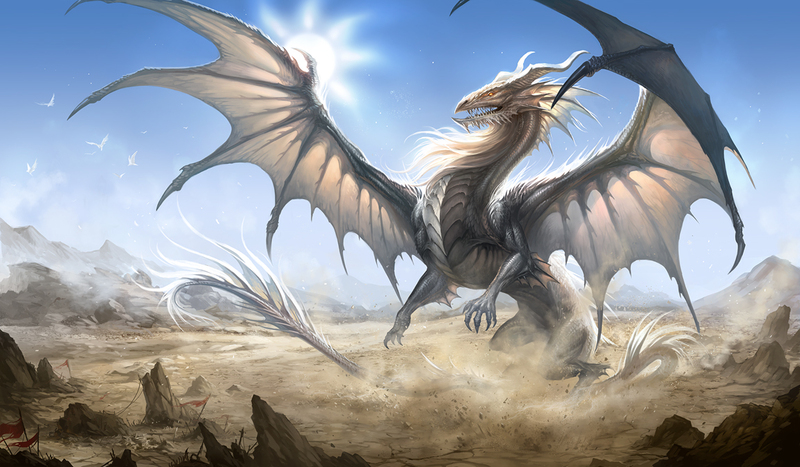 Dragons have existed in legends and folklore for hundreds, if not thousands of years. From ancient China, to Europe and the Americas, dragons seem to have played a role in every civilization throughout the ages. Emerging from the oldest known civilization comes the Sumerian Legend of the dragon, Kur. And the dragon stories persist to this day. Dragons have pretty much been a constant in human life throughout our entire known history. We've seen dragons on screen, and read about them in books, yet we lack substantial proof that they ever existed at all. Really, all we have is the stories. But where do the stories come from? 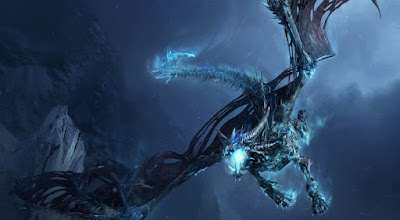 And why do so many cultures share the theme of dragons? The answer to that question would largely depend on where you are from. In some cases, they are described as flying serpents. Sometimes they are pictured as more similar to a crocodile or a lion. They can be feathered or scaled, and may have the head of a lion or even a horse! "My dragon stands roughly 5 meters tall. He has an unusually long neck and a decorative crest upon his head. His head alone measures 2.5 - 3 meters in length, 90% of which is mouth. This makes it easy for him to prey on smaller animals, and frankly, the majority of animals are smaller than he. He walks about on four legs, each roughly the size of an adult human being. But despite his colossal size and possibly immense weight, he is not a land-loving creature. Although he may roam the land from time to time, he can take to the skies if he must. My dragon has wings. White Dragon poses in the sunlight. Source. But, can he fly? You bet he can fly. 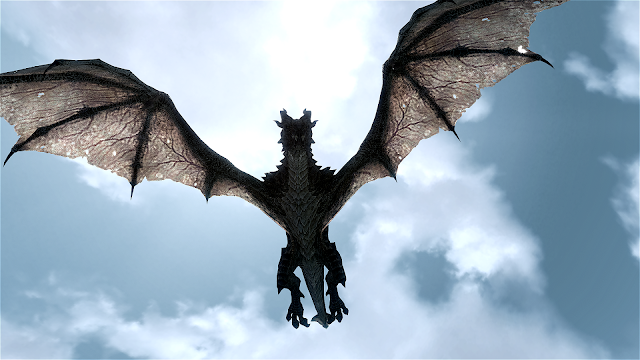 My dragon's outstretched wings span nearly 16 meters. That's larger than the wingspan of an F16 Fighter Jet. In fact, he is a long-distance flyer, fully capable of transcontinental flight. A transcontinental flyer would clearly be able to travel the world, hence his representation across widespread cultures across the planet." Does that sound like a dragon to you? Oh, I haven't forgotten about the fire-breathing part. Let's just say, my dragon can light up the night sky. This specimen has a wingspan of 12 meters. Source. Quetzalcoatlus was a Giant Pterosaur that dominated the skies during the Late Cretaceous Period. 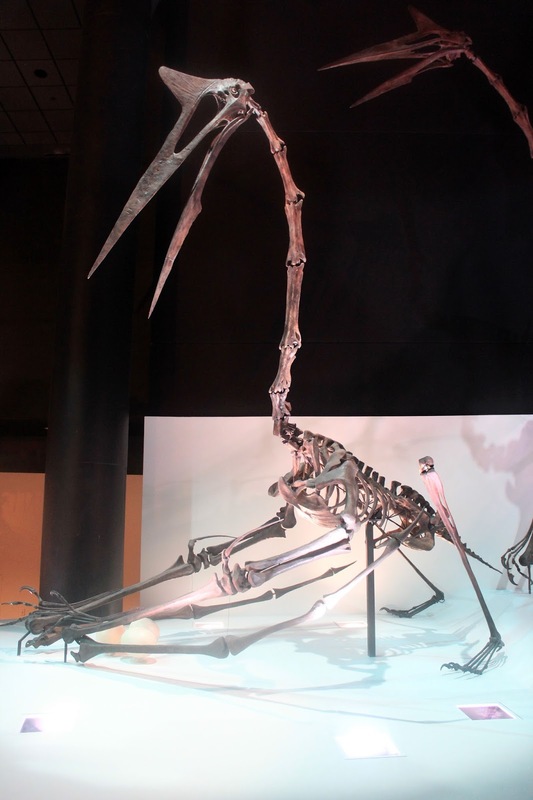 The Quetzalcoatlus towered as tall as a giraffe, and is the largest known creature to ever take to the skies. Although Quetzalcoatlus was toothless, specimens of earlier Pterosaurs, such as the Pterodaustro, had nearly a thousand needle-like teeth in their colossal bill! Since no existing species shares a similar body plan to the Quetzalcoatlus, scientists have struggled to determine the body mass of the creature. Earlier studies suggested a possible weight of 70-80kg, while modern research believes 200kg to be a more accurate estimate. That posed a new problem. Could something that heavy even fly at all? After further investigation, taking into account wingspan, estimated mass, weight, and aerodynamics, researchers came to this conclusion: Yes, Quetzalcoatlus could indeed fly. In fact, he could fly at speeds of up to 80km / hour for up to 10 days, reaching altitudes of about 4,500 meters. The final conclusion by biomechanics professor, Mike Habib, and paleontologist, Mark Witton, was that the Quetzalcoatlus had a maximum flight range of between 12,000 - 20,000 km. In case you're bad with distance numbers like I am, that basically means he could fly non-stop across the entire Pacific Ocean and more! Artist's rendition of Giant Pterosaur feeding on small dinosaurs. Source. Artist's rendition of traditional dragon preying on sheep. Source. Okay, so how about the Fire? Among the rocky cliffs of Umboi Island in Papua New Guinea, lives a creature referred to as "Ropen." "A featherless creature with leathery wings." "It has a long tail, about 10 - 15 feet long." "It is about the size of 'a small yellow airplane.'" "It has some sort of appendage on the back of its head." "It comes out at night to feed on fish at the coast." "It can sometimes be seen perched atop branches in the trees." Some suggest they may be describing a fruit bat, which are known to grow quite large. They do indeed come out at night, and have large, leathery wings. However, the largest species of Fruit Bat have a wingspan of just under 2 meters. Furthermore, Fruit Bats clearly eat fruit, not fish. Bats have no tails, and when resting, hang upside down. They do not perch. Continuing with the Ropen, it is reported to give off a bright light as it flies, which is "as bright as dawn." Biologically produced light is referred to as "bioluminescence." The majority of bioluminescent creatures thrive in the deep sea. However, there are several species of land and air dwelling animals that share this unique trait. Some argue that bioluminescence has never been observed in reptiles. That was before this discovery in 2015. You're walking down a small trail at night. The trail runs alongside a jagged cliff which towers high above, before disappearing into the embrace of the velvet night sky above. Shadows of shrubs and trees emerge from cracks in the stony wall. No one else is around, and not a light, save for the starlit sky. Just a few meters away, and dead straight in front of you. Wings spread, bringing it to a sudden mid-flight halt. The creature is unlike anything you have ever seen before -- its radiant glow illuminating it against the night sky. The light seems to emanate from the creature itself, blazing like fire in his eyes, and pouring out like liquid sunlight from every pore of its being. It opens its mouth, producing a shrill and deafening noise that resonates to the very pit of your stomach. That's when you turn to run. But it's too late. Okay, enough with the poetic-ness. I hope you liked my story. Glow in the dark Dragon. Hooray! Source. But haven't Pterosaurs been extinct for millions of years? According to our knowledge, humans and pterosaurs have never co-existed. Therefore, it would be impossible for these creatures to have been the stars of the plethora of Dragon Stories we have today. Pterosaurs are said to have lived in the Late Cretaceous, passing into extinction between 70-60 million years ago. However, it is also recognized that Pterosaur fossils are rare, due to the fact that the majority of them did not die in a way that allowed them to be preserved. I'm not going to debate whether or not modern Pterosaur sightings are real. Instead, I shall present real-life facts of other prehistoric creatures that roam our world today. 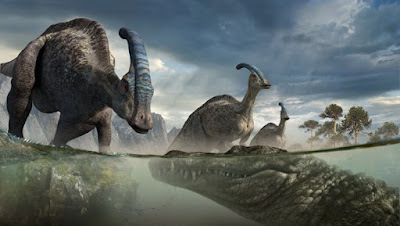 In order of the age of the species, here are three survivors of the Cretaceous Period and before, that have managed to evade extinction for hundreds of millions of years. 1. Crocodiles first began to evolve around the same time as Pterosaurs, during the Late Triassic Period of between 230 - 200 million years ago. The modern crocodile emerged a few million years after the mass-extinction of about 65 million years ago, evolving into the powerful aquatic carnivore we know today. Prehistoric Crocodile stalks its prey. Source. 2. Sharks began to emerge approximately 450 million years ago. Of all the modern species of shark that now wander our 21st century oceans, nearly all can be traced back to about 100 million years ago. In other words, modern species of sharks are about 100 million years old. That's about as old as Pterosaurs would be. 3. The Coelacanth attained its current state about 400 million years ago, and is among the oldest known species of animal live today. This odd marine animal is said to be one of the "transition species" between fish and tetrapods. A particular interesting characteristic is that unlike modern fish, the Coelacanth gives birth to live young! The Coelacanth is affectionately referred to as a "living fosssil," due to the fact that it was thought to have been extinct for 100 million years, existing only in fossil records. That is, until its rediscovery in 1938. Coelacanth specimen caught near Comoro Island. Source. 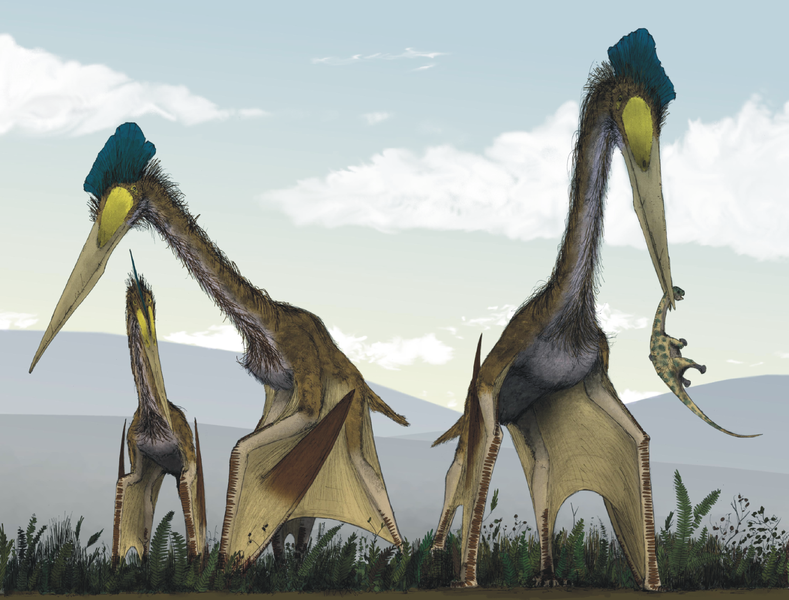 Quetzalcoatlus, the Giant Pterosaur, had a beak larger than an adult human being and could fly up to 20,000 km non-stop. Giant Pterosaur looks like a dragon. The Giant Pterosaur has a possible relative who is bioluminescent. Bioluminescence does exist in reptiles. Pterosaurs may or may not be alive today, but it is completely possible that they did co-exist with man.